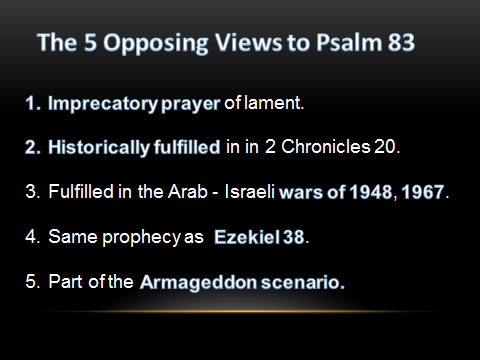 Is Psalm 83 really a Bible Prophecy? Doug Hamp and co-host David Lehman put Psalm 83 to the test in this According to the Scriptures Radio broadcast. Unlike many of Bill’s interviews, whereby the host simply invites Bill to exposit upon his Psalm 83 hypothesis, this one made Salus sharpen his pencil. They say iron sharpens iron, and that is certainly the case in this show. Are the Arabs listed in Psalm 83, identified in Ezekiel 38:5-6 as the many peoples with thee? Some of today’s top Bible prophecy teachers have struggled with the fact that Ezekiel may have intentionally omitted Israel’s Arab enemies from the Gog of Magog alliance. After all, the hordes of Russia must travel over these Arab states in order to penetrate into Israel, why wouldn’t they be identified. It’s not like Ezekiel listed a nebulous coalition in Ezekiel 38. No, to the contrary he listed nine very specific populations; none of which share common borders with Israel today. And, Bill points out that Ezekiel references the Psalm 83 populations at least 89 times in his 48 chapters, but not once does he list them in Psalm 83. Bill asks, why not? Listen in, and you decide if Psalm 83 describes a prophecy or a prayer. Also, find out what all the arguments are about Psalm 83.